Are you stressed out about how to attract the best and brightest talent, scale your culture, and still deliver growth? Many organizational leaders – whether you’re running a small business or a Fortune 500 company, a school or a non-profit – struggle with these and other workplace culture issues. Imagine instead creating a workplace that’s highly engaged, ridiculously effectively, and a magnet for top talent – all while growing bottom-line revenue multiple times over. Learn how to transform your workplace culture using the proven Freedom at Work™ system in this episode now. Hi everyone, great to be with you! Today we’re going to explore how to build a high-performing workplace culture using the proven Freedom at Work system that we teach here at the WorldBlu Academy. So many organizational leaders – whether you’re running a small business or a Fortune 500 company, a school or a non-profit – struggle with these and many other workplace culture issues. I want you to instead imagine creating a workplace that’s highly engaged, ridiculously effectively, and a magnet for top talent – all while growing bottom-line revenue multiple times over. That’s what we’re going to be exploring in today’s episode! My team and I have been working with top leaders and brands all over the world for over 20 years now, and when I first started doing this work, very few leaders even cared about workplace culture and even fewer leaders understood the direct line between your workplace culture and the bottom-line. I’m so glad to say that has FINALLY started to change. And as the talent wars continue to heat up, more and more leaders are realizing that their competitive edge isn’t WHAT they do – it’s HOW they do it. I think that most organizational leaders want lower turnover, more innovation, higher levels of engagement, more trust, greater productivity and efficiency, and overall less stress in their workplaces. But the problem is HOW I see organizations trying to achieve these goals. First of all, I see leaders trying to build high-performing workplace cultures through perks and incentives. They offer things like dress-down Fridays, bring your dog to work, nap rooms, free lunch, free beer, foosball tables, yoga classes, free tickets, lunch with the boss – you get the idea. The second way I see leaders trying to build high-performing workplace cultures is through technology. They think if they just get the ultimate collaboration software, or that app that helps make everyone more accountable, or that program that allows for more transparency everything will be just fine. The last way I see leaders trying to build a high-performing workplace cultures is by trying to hire it. It’s so easy to think if you just hire the world’s most perfect C-suite leader or manager, everything will be saved! Now don’t get me wrong – I think perks can be great for some things, I’m a huge fan of technology that democratizes power and increases transparency and accountability, and I do believe that having a high self-worth CEO or C-suite leaders can get you on the right track to building a high-performing workplace culture. But the reason these three things, either individually or collectively, don’t deliver transformational results is because . . .
None of these tactics address the REAL root problem that creates toxic and dehumanizing workplace cultures. None of these tactics start in the KEY place you MUST begin to build a high-growth culture. None of these tactics address the #1 thing you MUST do to build a sustainable high-performing culture, regardless of who is at the top. And none of these tactics actually TEACH people how to thrive in a high-performing workplace culture. What happens is that a TON of money is being wasted on incentives and perks that only create an entitlement mentality and don’t bring real meaning or satisfaction to employees. The perks and incentives act like a nice air freshner – they help remove the stink, but everyone knows there are still dirty dishes in the sink! While technology can be a great Trojan horse of change, often it acts more like a crutch while not really addressing the systemic causes of the cultural dysfunction. And a new top leader can come into the company, division, or team and everyone has to adjust to someone new who may -- or may NOT -- really know how to lead. It’s a roll of the dice! So if it’s not about perks and incentives or the latest technology or a cross-your-fingers-approach at hiring a new leader, what actually transforms a workplace culture from dis-ease to ease, from dehumanization to humanization, from fear to freedom? I started WorldBlu over 20 years ago, with a deep desire to build workplace cultures where people could realize their full potential and thrive so that everyone – and the bottom-line – would benefit. And over these past two decades years, my team and I have worked with leaders and organizations ranging from small companies all the way up to Fortune 500s. We’ve worked with schools and non-profits – even sports teams and governments. Overall, we’ve worked in just about every industry and with leaders in over 80 countries worldwide. When I first started this work, I thought the way to transform an organization into a high-performing, high-growth, and high-energy workplace culture was to change the organizational design. I focused my undergraduate and graduate work on organization design, and it’s what we taught to clients for the first several years we were in business. And through a process of luck and perhaps some divine intervention, it worked. But with more experience and research came more insight, and we soon discovered that there was WAY more to the equation than we initially thought. At WorldBlu, we’ve been certifying the most Freedom-Centered organizations in the world through a very rigorous assessment process we developed. As my team and I researched these top organizations over the years, we realized that organizational design was just ONE leg of a three-legged stool that must be in place in order to build a thriving culture and high-performance growth. It had nothing to do with perks. It had nothing to do with the flavor du jour in technology. And it had only about 12.5% to do with leadership. And last of all, they had an entirely differently approach to LEADERSHIP then we’d ever seen before. And you know what? Their approach delivered real results. These three elements to building a high-performing, high-growth, and high-energy workplace culture – MINDSET, LEADERSHIP, and ORGANIZATIONAL DESIGN, became what we call the Freedom at Work™ system. We use the word system, because it’s like building a healthy eco-system. You’ve got to have all three parts in order for it to work effectively. And we call it FREEDOM at work because of the intention you bring to these three elements. You could bring an entirely different intention and get a completely different result. But for us, it was about an INTENTION of freedom in order to get an OUTCOME of freedom. Because we believe freedom creates the optimal conditions for individual and organizational success. Period. And we can prove it. And when I say freedom, I don’t mean anarchy, a free-for-all, or lazzai-faire management. I’m talking about REAL freedom to everyone within the organization, the kind that is only achieved in partnership with real accountability. It’s the freedom for an individual TO realize their full potential in the workplace in a way that benefits them personally, benefits their colleagues, and the organization as a whole. And it’s also freedom FROM fear. Do you know what the #1 thing is that stymies and kills most workplace cultures, usually in that slow-death kind of way? Most people think it’s bad leadership that kills -- but it’s not. Most people think it’s a changing industry or marketplace – but it’s not. Most people think it’s failure to innovate – but it’s not. The #1 thing is kills most workplace cultures is fear. Fear is the #1 killer of workplace cultures. Yet most of the time we are trying to change the symptoms of fear on our workplaces instead of addressing the fear in people’s thinking that is causing the problems, poor decisions, and short-sightedness in the first place. So what does fear look like in the workplace? It looks like disengagement instead of engagement. It looks like distrust instead of trust. It looks like masking instead of authenticity. It looks like controlling instead of unleashing. It looks like pretending instead of honesty. And the problem is that fear costs us money – big time. All the brain research says that when we are in a state of fear, the peripheries of our brains shut down and we become myopic. And we end up making really bad decisions. We end up only addressing the short-term rather than looking at the long-term. And we end up being far less creative, innovative and visionary, unable to adapt fast enough to the needs of the changing market. And all that fear makes us not so fun to be around, either! So what do high-performing workplaces cultures do differently? Well, they address the fear and they choose freedom instead. And that starts with leaders bringing an entirely different MINDSET to the way they build, manage, and lead their organizations. This is where you MUST start if you want to build a high-performing workplace culture. You must start with a freedom-centered, rather than fear-based mindset. How do I get people to engage more? How do I stop all the drama? All of those issues, and many more, are the result of fear. So how do you shift your mindset from fear to freedom? First of all, we MUST to acknowledge that it IS fear and not something else that’s creating 99% of your problems. So often we just think it’s that person or that process or that circumstance that needs to change, instead of recognizing the mindset of fear that is driving the action, behavior, or bureaucratically-maddening process. But what’s underneath all of it is mindset of fear. So we have to ask ourselves, what we would do if we weren’t afraid? How would we solve that problem? How would we take that next step? How would we engage with others if we got really honest and addressed the fear in our thinking and exchanged it for freedom and possibility? That’s what the top leaders of freedom-centered organizations do. 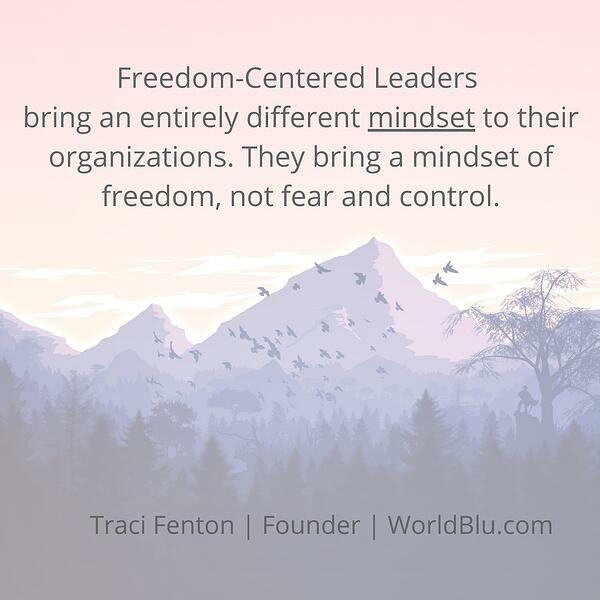 They bring an entirely different mindset to their organizations – a mindset of freedom, NOT fear and control. So the starting place is vastly differently than most organizations. And when you begin from the right place, you end up in the right place. This is what we teach leaders all over the world how to do. How to cultivate in themselves, and others, a mindset of freedom, not fear. So the first part of the Freedom at Work system is mindset. Now, let’s talk about the second part of the Freedom at Work system which is organizational design. Now there has been, and there always will be, many different theories and methods of organizational design. The problem is that most of them don’t address the mindset you have to have in place FIRST in order to practice the method and have it work. Also, most other organizational design methods are practice-based instead of principle-based, and are therefore not scalable or adaptable to different size organizations, industries or geographies. Command and control or organizational democracy. One is designed to control, the other is designed to unleash. One is designed to limit, the other to is designed to cultivate. One is designed to hide dysfunction, the other is designed to uncover dysfunction. One is designed to create fear, the other is designed to mitigate fear. Any other model out there is either some diluted or prescriptive version of these two main organizational models. Most of us know, that despite democracy’s founding centuries ago, the dominate model of organizational design – whether that design is of a company or a country, has continued to be the top-down, pyramid, command and control model. However, with more and more advances in every area of life, we’ve seen how the command and control repeatedly falls short. It’s not adaptive to today’s fast-paced and interconnected world and global marketplace. It’s not appealing to top talent to want to work in. And it’s proven to be too slow, inefficient, and quite frankly, dehumanizing. Command and control organization has had its day. I mean, you don’t see a lot of people rising up in rebellion so that they can have more command and control leadership in their lives. You don’t see people risking their lives to cross an ocean on a tiny boat for more command and control. And you certainly don’t see people giving up their time with family, their sense of well-being or dreams to work in more command and control workplaces. What do people risk it all for, fight for and stand for – and have done so – for thousands of years worldwide? And what’s the framework for freedom? Now this might come as a shock to you, but I didn’t invent organizational democracy. Democracy – and specifically organizational democracy, (because for the purposes of this podcast we’re talking about organizations), has existed for centuries. What we are doing at WorldBlu – and I trust is one of our major contributions to our time and to the world – is clarifying what exactly democracy is so that leaders can implement it with more clarity, intentionality and ease in their organizations – no matter the size, scope, industry or geography. What do I mean when I say organizational democracy? Am I talking about voting, no CEO, or the imamates running the asylm? If that’s what you think organizational democracy is, then you are wrong. So then I ask them – would you rather live in a democracy or a dictatorship? And after 20 years of asking this question, I still have yet to have any leader tell me they want to live in a dictatorship. So why do most leaders run their organizations that way, however benignly they try to window-dress it? Because we still live in a world where something like 95% of the organizations we interact with each day are some version of the command and control organizational model. It often starts in our families and then we see it in the way we run our schools -- and then it’s perpetuated, often unconsciously, in our workplaces. So we have to unlearn this old model and instead LEARN a new model of organizational design. We can't just stumble into it. We can’t hope our way into it. We can’t wish our way into it. We have to learn it, people! So what do I mean by organization democracy? Organizational democracy is NOT voting. Voting is a way of making a decision – it’s a decision-making method, it is not democracy in and of itself. There are many ways to make decisions – majority vote, consensus, consent-based decisions – you get the idea. But singular action of voting is NOT democracy. Organizational democracy is a system, like your body is a system. So you have to know what makes-up the system. And it’s not a singular act. Organizational democracy also doesn’t mean that you don’t have a leader. You do. In fact, you have an organization where every person knows how to lead, starting with leading themselves. You have an organization of leaders – not an organization of beaten-into-submission order-takers! And organizational democracy doesn’t mean that the organization is completely flat and without any hierarchy. What it does mean is that there is appropriate hierarchy where needed – and that’s usually quite minimal. So how do we define organizational democracy? Organizational democracy is a system, as I alluded to before, comprised of 10 principles. Why 10 principles? Because after a decade of research into democracy, we found that what actually creates a democratic system are these 10 principles. They are ALL causal – meaning, they are what cause democracy to happen, they are not the result of democracy. These principles have been studied and analyzed by many academics and researchers around the world and they’ve all found the same thing – you have to have ALL 10 principles in place in order to have a democratic system. If you’re missing even one principle, you may have a great place to work, or a bit or of a more “enlightened” organizational design, but you’re still in the command and control camp. And when one or more of these principles are missing, the system is off-balance. As a result, you get dysfunction, like people feeling they are treated unfairly, anger, and even more fear. That’s why all 10 principles must be in your organizational design to make it democratic. I’m sure by now I have you on the edge of your seat wondering what ARE the 10 principles of organizational democracy? ALL 10 principles must be in place to truly have a democratic system. I can't emphasize this enough. All 10. I remember years ago having a CEO tell me he picked his favorite few principles out and implemented them. All I could think was, “Noooooooo!” All you get with that is enlightened dictatorship – but NOT a democratic system. While you have to have ALL 10 principles built into your organization design to have the optimal framework for freedom, there are four principles that we’ve discovered through our research that are the main drivers of a democratic system. Think of these principles as the canary in the mineshaft so to speak. Depending on which way they are trending in your organization will determine if you’re moving toward a more freedom-centered culture or toward a more fear-based workplace culture. Now I’m sure you’ve also noticed that I also used the word principles – not values. Values are what guide behaviors and values can change. I truly believe every organization needs to have core values and we do at WorldBlu. However, these are principles of organizational design – and not just any organizational design, the #1 proven design system in the world – and principles, unlike values, are unchanging. Think of it this way – you can build a house of any shape or size, one story or four stories, A-frame or dome-home, but no matter what, there are universal architectural principles that must be adhered to in order for that home to be structurally sound. Principles are unchanging – they point to your true North. You use them to build. What's great about a principle-based versus practice-based approach is that principles are scalable whereas practices are not always scalable. Let’s take a look at the Transparency principles for example. The practice of transparency in a workplace of five people might look different than in an workplace of 5,000 people – but the principle remains the same. As you scale, the practices you have for transparency may change, but the principle will not. You just end up designing new practices that guarantee that principle is in place. Let me say it this way -- as you scale your culture, as long as you have the principle in operation, the practice may change, but your healthy workplace culture will still scale as long as the principle is in operation. I agree with you – if you’re talking about what most people THINK democracy is – but it’s not really democracy because most of the time, many of the principles of the system are missing. But when you have all of the principles in place, you create a much more efficient, fast-moving and adaptable organizational design, far superior to what command and control ever could be. I remember years ago, I was asked to speak at the US Naval Academy to a leadership conference for all the top students of the different US military academies. And you know what they wanted me to talk about? I was a bit concerned, because here I was, going into the place that literally invented command and control organizational design, and I wondered how my message would be received. After I gave my speech, I think if the young students in the audience had had tomatoes, they would have thrown them at me. They felt very loyal to the command and control system. But even more interestingly, one my one, the different officers from the Naval Academy stood up and told the students they needed to listen to me because this was the future of the military. So I left feeling pretty validated! Organizational democracy only works if you implement all 10 principles. Otherwise it just plain doesn't and it isn’t even organizational democracy – it’s just some wacky hybrid. The reason why so many workplace cultures FAIL is because leaders are throwing Band-Aids at their organizational systems rather than addressing the #1 thing that truly impacts your culture – and that’s it’s systems and processes – also known as best practices. In fact, what we’ve found in our research, which has been third-part verified, is that there is a 75% correlation between the systems and processes or best practices you have in place and how freedom-centered your culture is – or isn’t. Your culture is not built with perks or incentives, the latest technology, and not entirely on who you hire for the corner office. High-performing workplace cultures come down to the systems and processes you have in place being democratically designed. We’ve looked at mindset and organizational design, now it’s time to look at the third dimension of the Freedom at Work system, which is leadership. And then we’ll put it all together with a real live example. We now know that in order to build a high-performing workplace culture, you have to address the #1 thing that kills culture -- which is fear. We’ve also identified the key starting place for culture transformation -- and that’s mindset – the mindset of top leadership and ultimately the mindset of everyone within the organization. And we’ve identified the optimal framework for design – and that’s organizational democracy. Now we have to look at how we need to lead differently – and that’s learning how to lead from a place of freedom rather than fear and control. We call this Freedom-Centered Leadership. Most of the time people think about leadership as telling others what to do, or employing certain tactics or strategies to get others to things done. At its worst, this kind of approach to leadership can quickly devolve into manipulation, coercion, and outright abuse – in other words, a fear-driven approach. There are countless examples of fear-based leaders all over the world and in every industry. I’m sure just about every leader listening to this podcast has either worked for or with a fear-based leader – and perhaps you have even been (or are!) a fear-based leader yourself! I can’t tell you how many organizational leaders I’ve met through the years who love to use fear as a tool to control their employees. It’s like it gives them a rush, a feeling of significance, a sense of control. But in the end, they lose, and everyone who works with them does as well. Because while fear may win the sprint, it won’t win the marathon. What DOES win is a freedom-centered approach to leadership. I mean leading in a way that creates the conditions of freedom for everyone, so that people can truly thrive. Well, we’ve discovered there are three key attributes that make a freedom-centered leader. They are power, love and ubuntu. Power isn’t power over others – it’s the ability to stay in our power, to self-manage and self-govern effectively, so that ultimately our actions empower others. Love is about self-worth or loving ourselves, because when we do, we are secure in who we are and we aren't threatened by other people’s power and light. And Ubuntu is a concept I learned many years ago when I went to South Africa. It means, “I can only be at my best if you are at your best, and you can only be at your best if I’m at my best, because we are one.” To be at our best, we must KNOW ourselves, or have self-knowledge. Power, Love, and Ubuntu – all three of these attributes practiced, create a Freedom-Centered Leader. How to practice these three vital attributes is what we also teach leaders how to do and it has a deeply transformational impact on their life and the lives of those they lead. When we decide to transform our organizational design to be more freedom-centered yet FAIL to teach people HOW to lead in the new environment, it’s like a bird with one wing flapping up and the other flapping down. All it does is spin in circles until it hits the ground. 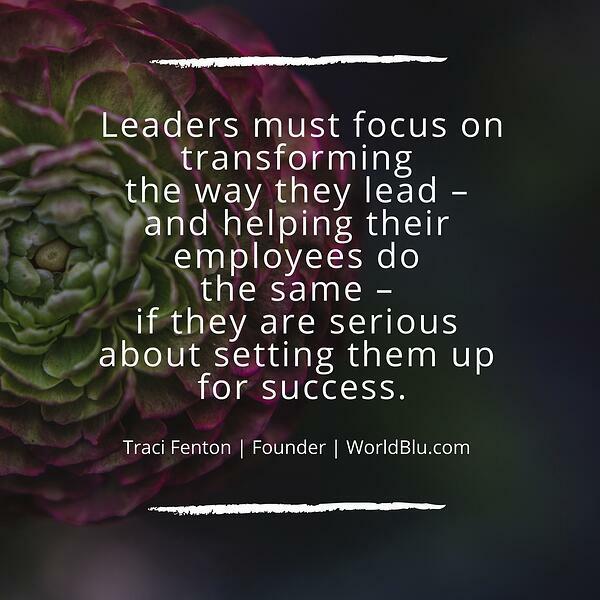 That’s why leaders MUST focus on transforming the way they lead – and helping their employees do the same – if they are serious about setting them up for success within a new organizational design. And that is the Freedom at Work system – mindset, organizational design, and leadership ALL in operation from a place of freedom rather than fear. Does this make sense? I hope so! Now, let’s make it even more practical and take a look at a powerful example of Freedom at Work in a company and the bottom-line results. Back in 1999, a healthcare company with a horrible name – Total Renal Care – was on the edge of bankruptcy, had sinking morale, and was under investigation by the SEC. The place was a mess, and top executives were jumping ship as quickly as possible. A major turnaround was needed, and so Kent Thiry, or KT as he is known, was the high self-worth leader hired to be the new CEO. KT came into the organization with an entirely different mindset. Rather than the slash-and-burn mindset of most quick-fix, turnaround artists, KT wanted to building a thriving democratic community. This freedom-centered -- rather than fear-based mindset -- immediately took him down a very different path. He started to look for ways to build this employees up rather than tear them down. He started to look for opportunities to give more power to his employees rather than controlling them. And he started to look for ways to mitigate fear and drama rather than create even more of it. At first, as I’ve heard KT share on many occasions, he stood alone. KT himself at times wondered if he was doing the right thing. But he had the moral courage to persist, firmly believing that he wanted to build a company that was a democratic community FIRST, and a company second. He even called himself the Mayor – not CEO. And their company wasa village. This freedom-centered mindset then led him to look at ways to redesign the organization to be less command and control and instead, more democratic. He decentralized as much decision-making power out from corporate headquarters to the thousands of dialysis centers they had across the US. He held open and transparent town hall meetings and “Voice of the village” calls, answering every question on the spot. If he didn’t know the answer, he found it out and later got back to everyone later. And he gave his fellow “teammates” as he calls them, the opportunity to vote on everything from the strategic direction of the company to their name. There were many other things that KT did to create a thriving democratic community. But he knew it wasn’t just about him. He had to teach his fellow teammates how to lead to sustain their new, much healthier environment. And he needed other top leaders who “got” it. And so he created DaVita University. DaVita University, which has been recognized as TOP provider of an “exceptional training and development program” by Training magazine, focuses on both personal and professional growth so that fellow DaVita teammates learn how to lead themselves, and others, with freedom rather than fear and control. While it’s not perfect, DaVita went from a toxic and fear-based culture that was on the edge of bankruptcy to being a multi-year WorldBlu certified Freedom-Centered Workplace. Today, DaVita is a $15 billion, Fortune 500, publicly-traded company. Their 52,000 teammates operate over 2,500 outpatient dialysis centers throughout the US and nearly 240 centers in 11 countries globally, caring for almost two million patients. Now, did everyone immediately get on the freedom-centered train at DaVita? Because a freedom-centered culture isn’t for everyone. But KT did something really smart along the way. He literally had a wooden bridge constructed and he then invited his fellow teammates to walk across the bridge when they felt truly ready to leave the old, outdated, and dysfunctional command and control model and commit to building a thriving democratic community at DaVita. And slowly but surely, teammates did! And those who just didn't feel they could buy into a freedom-centered approach, left to work elsewhere. I’ve had the opportunity to cross that very bridge and let me tell you, it felt really special. It made me feel like I was a part of something bigger than myself. And isn’t that what it’s really all about? Here’s my final point – Freedom at Work isn’t some utopian, kumbaya approach to business, it’s a PROVEN system that delivers real bottom-line results. You just heard the DaVita example of the bottom-line impact of Freedom at Work – taking a company from bankruptcy to $15 billion annually. Through an independent, third-party analysis that looked at WorldBlu certified Freedom-Centered Workplaces over a decade and compared them to the S&P 500, we’ve been able to show that companies that practice Freedom at Work have, on average, 7x greater revenue growth over a three-year period than the S&P 500. Let me say that a different way – S&P 500 companies had on average 15% revenue growth, while WorldBlu certified Freedom-Centered Workplaces had on average 103% revenue growth over the same three-year period. Freedom at Work delivers to the bottom-line, my friends. So, does your workplace struggle with low energy, poor performance, and disengagement? Do you wish your employees would be more authentic and honest at work? Do you hope your employees will figure out how to solve their problems and be leaders without always turning to you? And are you lying in bed awake at night stressed out about how to attract the best talent, scale your culture, and still deliver growth? The way to answer all of these problems and more is to address the #1 root cause of most culture-based problems, and that’s fear. It’s about cultivating a freedom-centered rather than fear-based MINDSET throughout your organization. It’s ditching the tired and outdated command and control organizational DESIGN for the vibrant, adaptable, and scalable design of organizational democracy. And it’s about LEADING with freedom rather than fear and control. Freedom at Work is proven to create the optimal environment for success – and it changes the world for the better in the process. Thanks so much for being with me today and remember to live, lead and work in freedom!